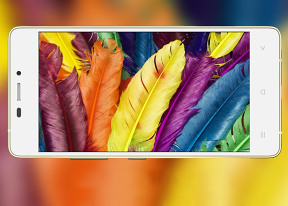 Gionee Elife S5.1 is powered by the mid-range MediaTek MT6592 chipset, which translates into an octa-core Cortex-A7 processor at 1.7GHz, Mali-450MP4 GPU and 1GB of RAM. We've already seen the same chip ticking inside the bigger Elife S5.5 and it offered quite uninspiring performance in the graphics department, mostly because of the higher resolution display. Now that the Gionee Elife S5.1 uses a lower-res 720p display (as opposed to 1080p), we hope things will be fine this time around. The 1GB RAM is still a concern and we'll explore thoroughly if this is a problem or not. Now, our first test is GeekBench 3, which gauges the overall processor performance. Even with eight cores inside, the Cortex-A7 isn't a powerful CPU core, so we didn't expect much. The Elife S5.1 did better than the HTC Desire 816, which also runs on MT6592, but its score is behind the rest of the MT6592 gang. The AnTuTu 5 also takes in consideration GPU and memory performance. The Gionee Elife S5.1 posted a good score by the AnTuTu charts, but it's once again uninspiring when compared to other smartphones powered by the same MT6592 chip. Next comes the compound BaseMark OS II benchmark. It tests the processor, memory, graphics, web and OS performance. The Gionee Elife S5.1 did great here, not that far behind the powerful Meizu MX4 and better than the MT6592-running Gionee Elife S5.5 and HTC Desire 616. The single-core and multi-core performance of the Cortex-A7 processor in the Elife S5.1 turned out great, beaten only by the Galaxy Alpha. This means you shouldn't have any worries about the raw CPU performance. Now, let's check the graphics department. The Gionee Elife S5.1 uses a quad-core Mali-450MP4 GPU, which has been around for quite a while now and doesn't support OpenGL ES 3.0. That's why we were able to run only the T-Rex test of the GFX Benchmark. The 1080p offscreen fps output of the Gionee Elife S5.1 is excellent, bettered only by the more expensive Meizu MX4 and Galaxy Alpha. The 720p onscreen results are pretty much the same, though you have to take in consideration that all the Meizu MX4, the Elife S5.5 and the Alcatel Idol X+ have 1080p native screen resolution. Gionee Elife S5.1 isn't doing well in all departments and we guess the insufficient RAM might be an issue at some occasions. The interface experience is smooth in the beginning, but once you start opening apps and using it on a daily basis, the Amigo OS becomes clumsy and there is this really annoying stuttering when scrolling panes or menus. The smartphone did well as far as handling apps is concerned - it packed enough processing power to do properly in running office apps, cloud services and popular games. 3D games run OK too, but some more demanding eventually eat all the resources and the result is good ol' lag. Overall, the Gionee Elife S5.1 is good enough for its class but either because insufficient RAM or because of improper optimizations, the performance isn't on par with the competition.